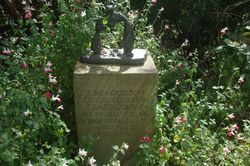 The sculpture honours the lives of the six children and one adult who died tragically in the fire on the Ghost Train at Luna Park on 9 June 1979. 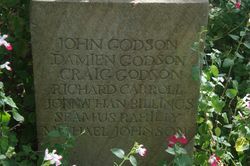 John Godson and his two children Damien and Craig, along with Jonathan Billings, Richard Carroll, Michael Johnson and Seamus Rahilly, all lost their lives. Relatives of the victims planted seven rose bushes at a private ceremony. The Sydney Ghost Train fire was a fire that destroyed the ghost train amusement ride at Luna Park Sydney on the night of 9 June 1979. Inadequate fire-fighting measures and low staffing caused the fire to completely destroy the ride, which was first constructed in 1931, and had been transported from Glenelg, South Australia to Milsons Point, New South Wales during 1934 and 1935. Although electrical faults and arson by underworld figures have been claimed, the exact cause of the fire could not be determined by a coronial inquiry. The coroner also ruled that, while the actions of Luna Park's management and staff before and during the fire, in particular choosing to not follow advice on the installation of a sprinkler system in the ride, breached duty of care, charges of criminal negligence should not be laid. The case was reopened in 1987 and no new findings were made, although the police investigation and coronial inquiry were criticised. The fire forced the closure of Luna Park until 1982, when it reopened under a new name and new owners.